Keep your eyes to the skies. 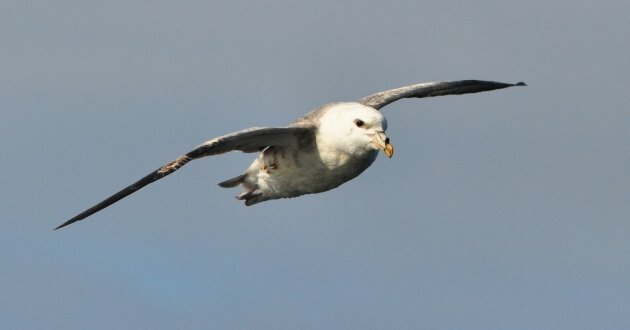 Maybe you’ll get lucky and see the bird that may some day be called Pacific Fulmar! Since migration is allegedly over, I’m going on strike until autumn. Corey, on the other hand, will spend the weekend reveling in resident breeders all across New York State. Even he doesn’t know where he’ll end up, but there will be birds. How about you? Where will you be this weekend and will you be birding? Share your plans in the comments below. Doodletown. I don’t even care if I see any good birds. The name just cracks me up. Cool capture and sighting. I would love to see a new bird this weekend. Happy Skywatching! nice capture… we just returned from a trip where we saw lots of birds, many of them migratory ones. we thought they would have been gone by now,but as someone said, there are some birds or the other all the time. so anytime is a good time to go birdwatching! @Mike: According to fellow Chicagoans, migration is mostly over here (although there are still some warblers hanging around — slackers!). Our collision-monitoring team has been picking up mainly flycatchers and cuckoos for the past few weeks, and local birders’ focus seems to be turning to shorebirds. The season came and went too fast this year! Heading to Democrat Point at Robert Moses State Park. Hope to see some shorebirds! Robert Moses was not very birdy but I had a few good sitiings. It was the first time. I had ever seen black crown night herons walking down a beach! Also saw a pair of nesting piping plovers. One seemed not to care I was nearby and walked right over and posed.